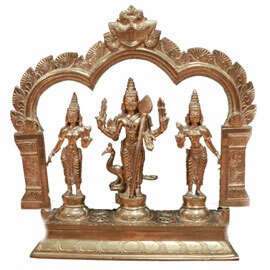 9 Inch Muruga (with his consorts Valli & Devasenna) Statue Created in India and energized before shipping. Dr. Pillai says, "Muruga is an archetype. He represents the primordial energy force identified in every ancient tradition in their own imagery. To me, he is the photon light from the Pleiades that is going to start the golden age in 2012." Created in India and energized before shipping. Dr. Pillai says, "Muruga is an archetype. He represents the primordial energy force identified in every ancient tradition in their own imagery. To me, he is the photon light from the Pleiades that is going to start the golden age in 2012."